The aim of this chapter is to acknowledge the influence that the interaction-based observation method developed by Mariane Hedegaard has had on my studies of young children’s friendship activities. Hedegaard has problematized how the existing methods of evaluating children’s development were inadequate. These methods were based on the assumption of testing children as if a test situation can be a neutral and context-free activity. Hedegaard developed an alternative approach, the interaction-based observation method. The approach brings to the fore ethical considerations while it focuses on identifying children’s motives and competences. By taking the child’s perspective, it places the researcher as interpreter of children’s apparently intentional actions and the motives they convey, giving considerable power to the researcher. In this, Chap. 1 considers the method and its ethical implications for early childhood research and how Hedegaard’s methods address these concerns. 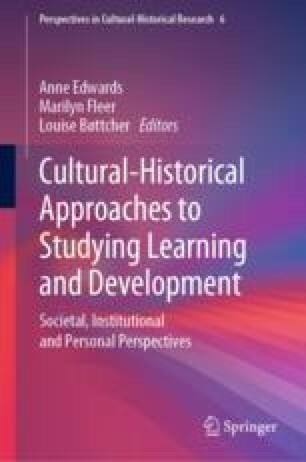 The method also offered a new and important perspective on analyzing pedagogical practices and the conditions in institutions when considering children’s learning and development. Since the 1980s, the interaction-based observation method has been fundamental to the education of pedagogues in early childhood pedagogy in Denmark. These same ethical concerns and ways of overcoming them are therefore also relevant to early education practice.